We've got a sneak peek at some more development work being done on the newest Poptropica Island. It's a top down view, and it looks like that SUV has its top down, too! What do you suppose is happening here? Which one do you like the best? Vote in our poll on the sidebar! 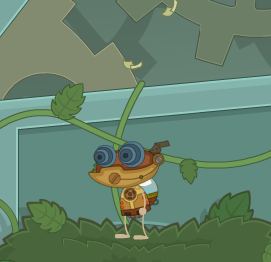 Several Poptropicans have reported that a Steam Robot has recently escaped from Steamworks Island! 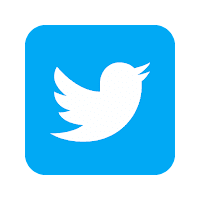 We have this image to show you what it looks like. Take a look in the Poptropican store. It may be hiding there. Before we move onto the next phase of the design, here's one more approach to the big mansion that will serve as an integral part of a new Poptropica Island. Those columns certainly are regal. You'd have to be a pretty big hotshot to have columns like that around your front door. But which of these designs will ultimately make it into the new Island? Here's a different approach to the big houses that we've been sketching for an upcoming Island. This one's a little more modest, wouldn't you say? Not enough skulls and crossbones, if you ask me. How many different ways can you imagine a big, fancy house in the country? If you were a Poptropica Creator, you'd have to imagine several. Yesterday we showed you one such sketch. Here's another. This isn't even all of them! We'll show you a couple more of these early designs as the week goes on. Steamworks Island has been a smashing success! We're all very proud of it. Poptropica Members are already exploring the mysteries of the Island, and the Island will be available to all before you know it. So, what do the Poptropica Creators do after a new Island launches? Surely we've earned a little R+R, right? Not on your life. We're already hard at work on the next Poptropica adventures. Here's an early sketch of something we've got cooking. That's a nice-looking house! What kind of a person do you suppose lives there? Here's a simple tip to help you make your way through Steamworks Island. If you're getting stuck, take a look around for one of the long, blue-handled switches. They're everywhere, and most of them will help you get to somewhere that looked out of reach. So if you're stuck, just look for a switch! As a Poptropica Creator, I try to leave my mark on Poptropica whenever I can. Like on a blackboard on Steamworks Island, say. Shh! Don't tell anybody, or they'll erase it! Piloting the mech around Steamworks Island is tons of fun! It also presents its own challenges, especially because of its size. Did you know that the mech can crouch, just as your Poptropican can? This can be helpful in many situations, especially against the Bolas plant. See? Duck, and the seed pods will sail safely over your head! You can still use your weapon attachments from a crouching position. Of course, when you're ducking, you can only aim downhill. What other neat things have you found to do with the mech? The Fortune Cookie has just arrived in the store. Pearls of wisdom from the minds of the Poptropica Creators have been carefully placed inside each of these cookies. 2. 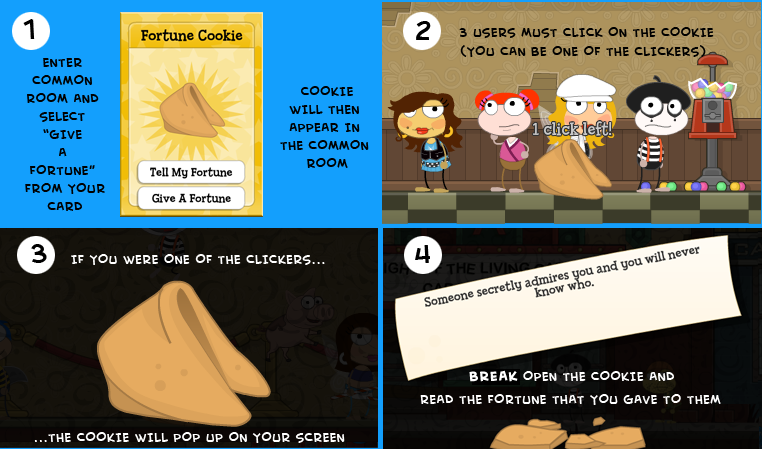 Place the cookie in common rooms to provide the future for unsuspecting Poptropican users. 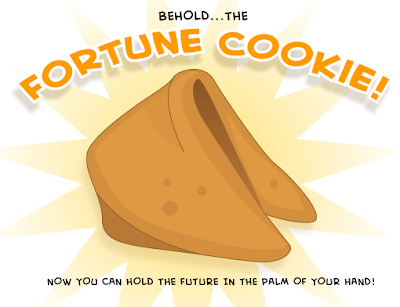 Follow these simple guidelines to place a fortune cookie among others then wait for them to click. Poptropica Members have been having a blast on Steamworks Island. Besides trying to solve the mystery of what happened to the Island's inhabitants, Poptropicans have also been spending a lot of time at the Steamworks Gear Shop -- that's this island's common room. It's been fun to see Poptropica Members hanging out on a new Island, with all the zany combinations of costumes and items they can imagine. Check out this motley crew! I dropped by, too, but nobody told me there was a dress code! I felt out of place not wearing a Mech Pilot costume. Keep an eye out for the Poptropica Creators in the Steamworks Island common room. Maybe we'll see you there! Congratulations to the first 10 finishers of Steamworks Island! Despite the difficulty, lots of Poptropica Members, with a full head of steam, have already worked their way to the end. See what I did there? 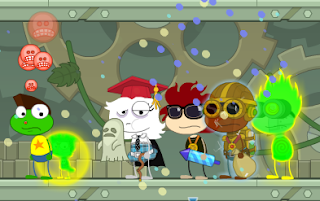 Congratulations to the first 10 Poptropicans to complete Steamworks Island! Your reward: your name in lights! We'll hope to see many more of you crossing the finish line in the days and weeks to come!